Fraud is widespread and continues to grow, especially online. It’s a major problem in a variety of industries and government agencies far beyond the familiar areas of financial and retail fraud. 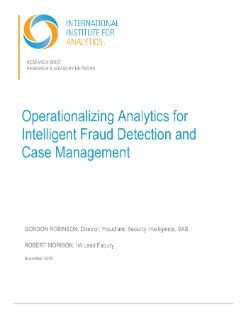 As fraudsters innovate and scale up, fraud prevention and investigation become more challenging. To discuss today’s challenges and how advanced analytics helps prevent fraud, IIA spoke with Michael Ames, Senior Director of Data Science and Emerging Technologies at SAS.